King Skarl stared at the letter in his hands. He couldn't quite believe what he was reading. It was completely unexpected. They hadn't conversed in years, but now he wanted to write to him? This was odd. Something didn't quite add up. Those were his original thoughts. Now, as he read the letter, he realised why he was suddenly writing to King Skarl. And it certainly wasn't for a catchup on things. It's that time of year again. Summer. The time when we use our newly found downtime to visit our beloved pets, spin wheels, do dailies, play games and win trophies. Well, everything except that last part. If you felt like the living embodiment of the grey Wocky avatar at the mention of games and trophies, you might be facing the dilemma of the bad gamer. Deep within the macabre wetland of the Haunted Woods, hidden by the swamp gases and crooked trees shrouded in tangles of spongy moss, there was a foreboding abode that stood on the muddy river bank. Composed of rotten-looking shambles of wood, it looked like the slightest gust of wind could knock the entire residence on its side. But it was the enigmatic ixi that called this dingy shack home that really gave rise to the mysteries. Her name was Sophie, Sophie the swamp witch; and as the dark windows of her house emitted ominous flashes of glowing green light, one could only wonder… What was that wily witch up to exactly? Penny walked up to the cafe and breathed a sigh of relief. She giggled as the sigh took the form of steam. She trotted in and shut the door firmly behind her. “Not used to Terror Mountain weather, eh?” the Kougra behind the counter asked. “Definitely not,” Penny replied, unwinding her scarf and setting it on a table with her hat. “I thought it would be a nice break from the summer heat and it was…for about ten minutes.” “Well, you’re welcome to warm up in here as long as you’d like. What can I get for you?” Penny sat at the table, glad to give her hooves a break. “What’s your specialty, Reg?” she asked, noticing his nametag. IIn the garden of number forty eight, Rainbow Lane, Neopia Central, stands a tree house. But this is not just any treehouse. This treehouse is the headquarters of the Super Secret Club. It’s Super (of course) and Secret (naturally) and the Club risk their lives on difficult, dangerous missions, like retrieving the ball that fell into Mrs-Jenkins-Next-Door’s garden, and taming the wild Warf that somehow managed to crawl through the hedge. There’s no mission too big, no task too terrifying. They will work tirelessly to ensure that justice prevails in the garden. Until nap time, that is. 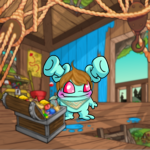 Every Neopet Needs A Job! I took the paper and read it. "Join the Sway or face the consequences," the note said.